No, I dont type like that normally but I wanted to say a hello that’s as enthusiastic as I am now. I made this lace crochet purse and I’m beyond proud of how it looks after I’ve completed it. As I was typing the title of this post, I couldn’t help but gleam in satisfaction, for a number of reasons. One, I finally came up with a pattern for a knit beanie, although my contribution is little. 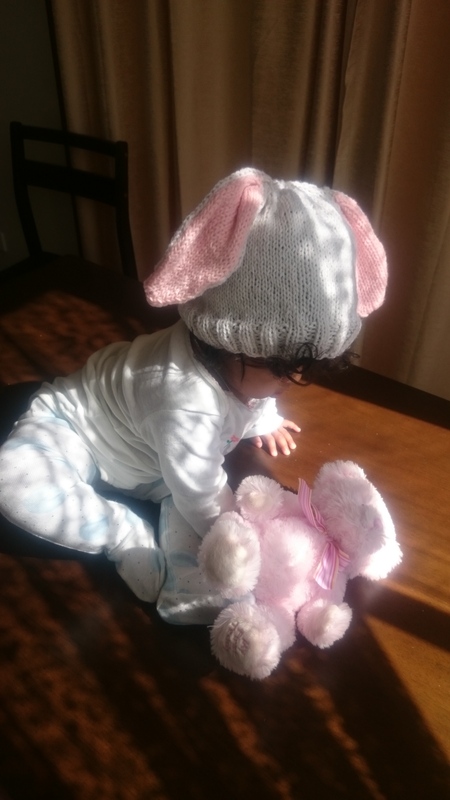 Two, I finally had time to put up a blog post and a pattern that I love, with a baby girl who just discovered crawling and is teething at the same time. Three, I promised myself I would get it out before Easter and there it is. Alright, all the chit chatter aside let’s get on to the pattern with the disclaimer. I’m no expert at pattern writing or at knitting, I taught myself to do both and I love sharing how its done for those who are interested. 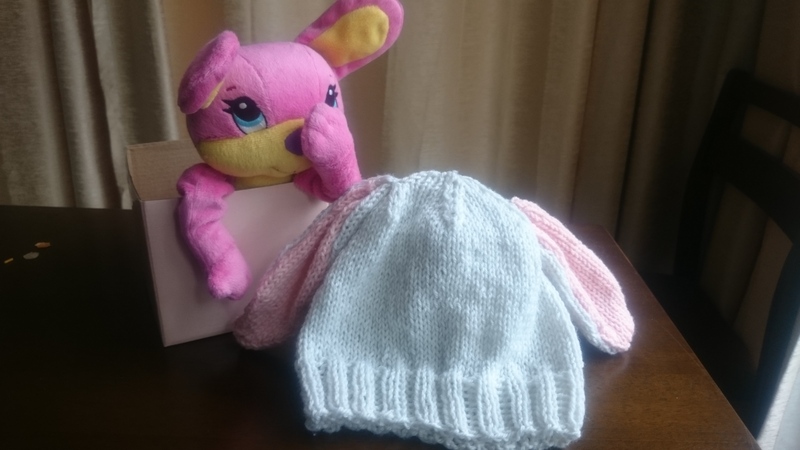 I made a basic beanie following the pattern for a 12 month old basic baby beanie from Mamas stitchery projects. I’m so thankful for the wonderfully written free pattern on that blog. However since I used a bigger sized needles, my gauge was way off and I ended up with a slightly bigger circumference. Although it somehow fit my baby girl so all is well. Now getting on to the rabbits ears, I wish I had double pointed needles so I didn’t have to sew the two bits, but I only had circular needles at hand. I followed the pattern on the fore mentioned blog to tee for the beanie. Now heading on to ears make two of the white parts for the outer ear and two pink bits for the inner ear. The white part is slightly bigger than the pink part so that it is still visible in the front as well. Using white colored yarn, cast on 16 stitches. I used the long tail knit cast on, and then stockinette stitch for 11 cms. k1, ssk, knit 10, k2tog, k1. k1, ssk, knit 8, k2tog, k1. k1, ssk, knit 6, k2tog, k1. k1, ssk, knit 4, k2tog, k1. k1, ssk, knit 2, k2tog, k1. Place the white part and pink part with the right side facing one another and sew around. These pictures should give you an idea as to how its done. Ta da! now that you have the two ears, fold it and sew it to the beanie. Actually I love the way it turned out, exactly the way I want it to be. 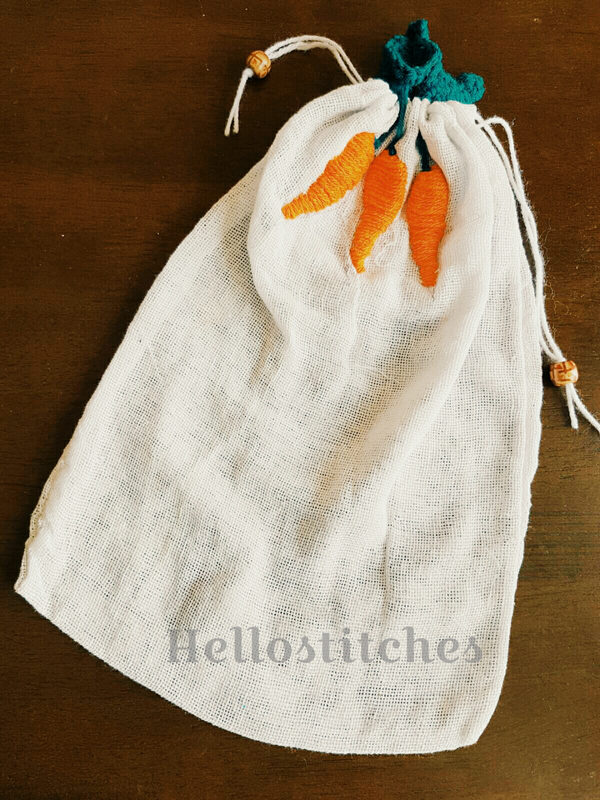 My carrots have stayed fresh for over a week and I couldnt be any more happier with this pretty bag. Hello! I fell in love with these cookie style boots the moment I saw them and made one for my little bubby. At that time I only had four ply yarn in hand and the pattern called for a chunkier wool. So I made up my own counts and here they are. I wouldn’t say they were perfect looking but still looked cute enough. There’s a video on YouTube which should help you with attaching these two patches together to make these boots.